Who were the biggest fans of the Camino de Santiago by nationality in 2013? Of the 215.880 pilgrims receiving the Compostela certificate in 2013, most of them (49,05% of the total) were from Spain (105,891), according to the statistics released by the Pilgrims Office in Santiago de Compostela. 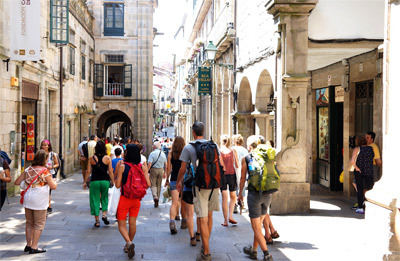 These statistics reflect the number of travellers receiving the ‘Compostela’ certificate. In order to receive the ‘Compostela’ pilgrims must walk at least the last 100km to Santiago (or cycle/by horse the last 200km) so these statistics don’t include those people walking sections of the Camino not finishing in Santiago, walking less than the distance required to obtain the ‘Compostela’ or those who haven’t requested the certificate. Do you want to walk the Camino de Santiago this year? Contact the CaminoWays.com travel team at info@caminoways.com. What date do prices drop after the summer trips? Thanks. We are still planning our journey.